May your right hand, O Lord, we pray, encompass your family with perpetual help, so that, defended from all wickedness by the Resurrection of your Only Begotten Son, we may make our way by means of your heavenly gifts. Through our Lord Jesus Christ, your Son, who lives and reigns with you in the unity of the Holy Spirit, one God, for ever and ever. According to the 1962 Missal of St. John XXIII the Extraordinary Form of the Roman Rite, today is the feast of St. Peter Celestine, founder of the Celestine Order who was elected pope when he was 72 years old and reigned for five months. And today is also the feast of St. Prudentiana, daughter of a Roman senator, who consecrated herself wholly to Christ and died in the year 160 when she was sixteen. The Roman Martyrology also mentions "St. Yves, priest and confessor, who for the love of Christ, defended the cause of the orphan, the widow and the poor." Mary gave Jesus to the world and with Jesus came every other blessing. Thus, because of Mary we have the Church: "Mary is the Mother of the Church not only because she is the Mother of Christ and his most intimate associate in 'the new economy when the Son of God took a human nature from her, that he might in the mysteries of his flesh free man from sin,' but also because 'she shines forth to the whole community of the elect as a model of the virtues' (Lumen Gentium. 55, 65). She now continues to fulfill from heaven her maternal function as the cooperator in the birth and development of the divine life in the individual souls of the redeemed" (The Great Sign, by Paul VI). What do we have of value that we have not received through Mary? It is God's will that every blessing should come to us through her. 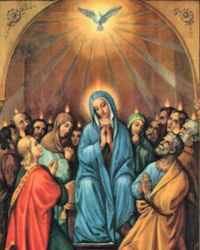 Several religious congregations practice devotion to Mary under the title of Queen of Apostles, including the Pallotines, the Marianists, and the congregations founded by Bl. James Alberione (the Society of St. Paul, the Daughters of St. Paul, and several others). In the twentieth century, Bl. Alberione promoted this devotion in a particular way. The pious hermit and founder of the Celestine Order, Pietro di Morone, was born about the year 1215, the eleventh of twelve children. After the death of Nicholas IV, a conclave which lasted more than two years elected him pope on July 5, 1294. He became known as Celestine V. Only the chaotic condition of the age plus the intrigue of King Charles II of Naples can explain the selection of this holy man, who obviously was not conversant with the ways of men or of the world. It soon became evident that the choice had not been a happy one. Feeling himself incapable of bearing the heavy burden, Celestine resigned on December 13, 1294, five months after receiving the tiara, and resumed the cherished, simple life of a monk. 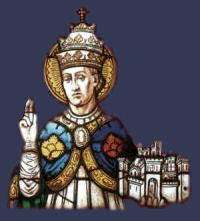 He was succeeded by Boniface VII who had reason to fear that his opponents might use the former Pope to create a schism. To prevent such a calamity Celestine was detained under careful guard in the castle of Fumone near Anagni, where a replica of his former monastic cell had been erected. Here he passed the remainder of his life in acts of holy penance. St. Peter Celestine proved one could place a life of humility above the highest ecclesiastical honors. Think of a specific way in which you can imitate him. St. Ives, born at Kermartin, near Tréguier, Brittany, 17 October, 1253; died at Louannee, 19 May, 1303, was the son of Helori, lord of Kermartin, and Azo du Kenquis. In 1267 Ives was sent to the University of Paris, where he graduated in civil law. He went to Orléans in 1277 to study canon law. On his return to Brittany having received minor orders he was appointed "official", or ecclesiastical judge, of the archdeanery of Rennes (1280); meanwhile he studied Scripture, and there are strong reasons for holding that he joined the Franciscan Tertiaries sometime later at Guingamp. He was soon invited by the Bishop of Tréguier to become his "official", and accepted the offer (1284). He displayed great zeal and rectitude in the discharge of his duty and did not hesitate to resist the unjust taxation of the king, which he considered an encroachment on the rights of the Church; by his charity he gained the title of advocate and patron of the poor. Having been ordained he was appointed to the parish of Tredrez in 1285 and eight years later to Louannee, where he died. He was buried in Tréguier, and was canonized in 1347 by Clement VI, his feast being kept on 19 May. He is the patron of lawyers, though not, it is said, their model, for — "Sanctus Ivo erat Brito, Advocatus et non latro, Res miranda populo." He is noted as being a great preacher and arbitor. He built a hospital with his own money, providing for the sick poor. He is known as a miracle worker, with an instance of feeding hundreds from a single loaf of bread. — Excerpted from Catholic Encyclopedia. Patron: abandoned people; advocates; attorneys; bailiffs; barristers; Brittany; canon lawyers; canonists; judges; jurists; lawyers; notaries; orphans. Symbols: Scroll with legal seals; law books. Often represented as: lawyer enthroned between rich and poor litigants; lawyer holding a book, with an angel near his head and a lion at his feet; lawyer surrounded by suppliants, holding a parchment and pointing upwards; lawyer surrounded by symbols of the Holy Spirit such as doves.